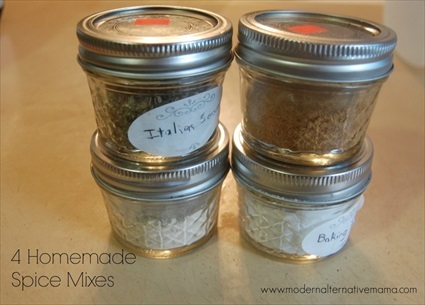 Kate of Modern Alternative Mama put together a number of different spice blends. These are super easy to make, and they are totally natural. No additives at all. You can also customize the blends by taking out spices you don’t like or adding spices that you do like. Where Can I Get Spices? I buy all of my spices online at The Spice Shack. Click HERE to visit their site. If you have any questions about a spice, Michelle, the owner, is extremely knowledgeable. The Spice Shack also sells aluminum-free baking powder. Click HERE to see the baking powder and check pricing.